We're off on another epic adventure across the world. 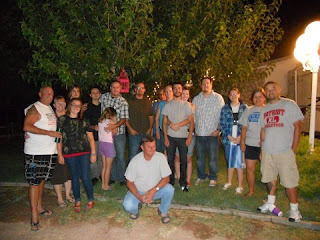 We gathered for prayer and last minute packing arrangements (redistributing stuff to make sure we're all under the weight limit) this morning at Pastor Chuck's before heading off the Las Vegas for the first flight of our journey. We made it to the airport with time to spare, got through security in no time, found our gate and then grabbed a quick breakfast. Special thanks to the Hartmans and Jim White for driving us up to the airport! After boarding on time, we found ourselves sitting for awhile past our departure time before finally hearing the announcement that a seal was bad on our aircraft. To make matters worse, the airline did not have the seal in stock here in Vegas. However, another airline has now loaned them the part. We are currently de-planed and waiting for repairs before boarding again and resuming our travels. Three things are keeping my heart calm and peaceful right now. We have a 4-hour layover in New Jersey, so this delay shouldn't affect our overall schedule. This is my fourth trip to BG and we have never had an eventless journey. My first year, the Sofia Airport was closed because of a fire, forcing an overnight stay in Germany. On our second trip, we missed our connection in Germany, leading to a 7-hour delay. Last year, the vehicle taking us from Bullhead City to Vegas overheated the whole way and we arrived at our gate in the nick of time! This delay fits the pattern perfectly! God is in control... Seriously, We're going in His name by His calling and strength and we completely trust Him to make it happen. We know He's got amazing plans and we can't wait to see them unfold regardless what happens to oppose them. Having said all that, I'm really hoping we keep our schedule intact. We're supposed to arrive in Sofia, Bulgaria at 12:10pm tomorrow and I'm supposed to be teaching at the Blaga Vest church tomorrow evening. I'm really looking forward to it! Because of our previous mishaps (and last year's Thursday departure), I've never even been to a church service at Blaga Vest... really excited about this year!